This thing was touted as the minivan killer by some. I don’t think GM ever said that, but I read a few previews of it, saying this will give minivans a real run for the money. Let’s see if it does. The Orlando is an interesting case, because GM decided to only bring it to Canada at this time, citing too much overlap in American segments with the Traverse and the Equinox. That’s a bit weird to me, because we have the same vehicles here too. The Orlando starts at a very reasonable CDN $19,995 – my review sample was the Orlando 2LT, and comes in at CDN $26,540. GM’s ubiquitous Ecotec resides under the flat hood, a 2.4-Litre inline-4 in this case. You’ll find it elsewhere too, and it’s a good engine. It makes 174 HP @ 6700 RPM, and a solid 171 lb.ft of torque at 4900 RPM. Those numbers aren’t spectacular, of course, but when they’re routed through a 6-speed automatic and only lugging 3519 pounds around, they’ll do just fine. Although you’re not in a street rocket, you’re rewarded with exemplary fuel economy, considering it’s not a hybrid and it can carry seven passengers or a whole lot of cargo. The Orlando is rated at 10.6 L/100 km (22 mpg) in the city, and 6.9 L/100 km (34 mpg) on the highway and I tend to believe these numbers. In my week with it, I achieved 11.1 L/100 km (21 mpg) doing mostly city commuting, with absolutely no effort to drive efficiently. It has a 65 Litre tank, which makes for a nice road trip. The Orlando isn’t sculpted so much as chiseled out of a box. Smooth flowing lines don’t result in good use of space, and therefore it’s much more of an upright, boxy shape. I quite like the styling – don’t get me wrong, it’s not beautiful. But it’s also not pretending to be anything it isn’t. It’s stating its mission, and saying I’m here to move people or stuff. I’m not here to look slick, but I will get the job done. And I appreciate that honesty in its styling. The lines are still smooth, and a slightly sloping roofline and thick rear pillars hide some of the bulk back there. The grille looks happy and the rear end has a raised-eyebrow feel over the tail lamps. All in all, it’s a utilitarian design that is unlikely to offend and also unlikely to get a second look. 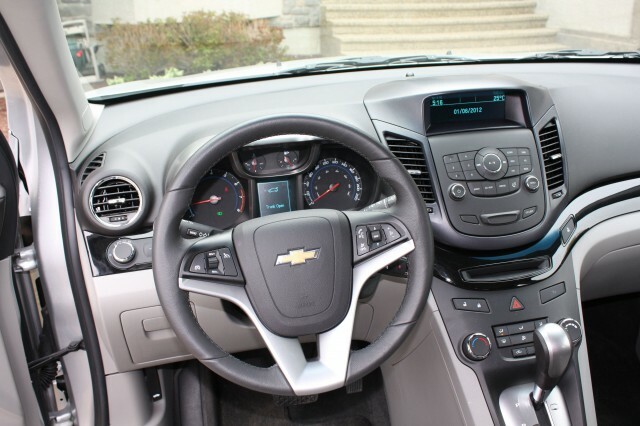 Step into the easily accessible interior and you’ll find simple, clean styling that doesn’t look or feel cheap. There are nicely textured soft-touch plastics on the dash and doors, plenty of headroom and comfortable, manually adjustable seats. I liked the flip-down armrest, but wished for more bolstering. The smaller diameter steering wheel works well, and has buttons for phone, handsfree, media and cruise control – it sits in front of a gauge cluster that I thought could be easier to read during the day. Between the main gauges sits GM’s now-familiar driver information screen, offering fuel economy, trip meters and other data. At the top of the center stack is another screen, which we’ve seen in other GMs as well. Although the screens are crunchy and the text and graphics could be prettier, they work well. Media, phone and climate control information is offered up in the top screen – it changes as you make adjustments to those systems. Below it are a series of hard buttons, and below that, a manual climate control system. The stack is angled and therefore continues on to about the middle of the center console and houses the shift lever and a 12V plug as well. The ergonomics work well with this design. The stereo offers AM, FM, satellite, CD, USB and auxiliary sources – it sounds alright, but not great. Power windows, door locks and mirrors are standard, and it has automatic headlights. 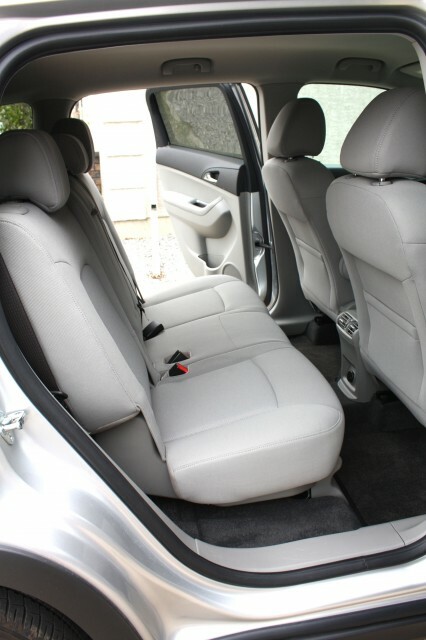 The second row is very easily accessible with good step-in height and doors that open wide. You’ve got three seats, three seat belts and three headrests – the headroom is fantastic, and the leg/knee room is fine – space is great for 2 adults or 3 kids. The seats are relatively comfy – the seatbacks recline, but offer absolutely no bolstering. The middle seatback folds down into an armrest with cupholders, and you get 2 seatback map pockets, small door bins, and a dome reading light. At the back of the center console, you’ll find adjustable air vents and another 12V plug. 2 LATCH anchors are provided for kids’ seats. The third row is accessible by tumbling one or both sides of the second row forward and out of the way. You get built-in grab handles to assist getting in and out. Although it’s quite claustrophobic back there, the leg room was passable (even for adults) and headroom is also acceptable. The seats are decently comfortable – there are 2 seats, 2 seat belts and 2 headrests. As expected, the space is just fine for kids, and will do for adults. Let’s talk storage. In the cabin, I found myself wanting for more nooks and crannies. You get 2 cupholders in front, and a small covered bin, a flip-out bin on the left underside of the dash, and a decent lit glovebox. There are skinny door bins with bottle holders and that’s it. But hey, if you need to move stuff, head on back. The trunk is part of the real story with the Orlando. 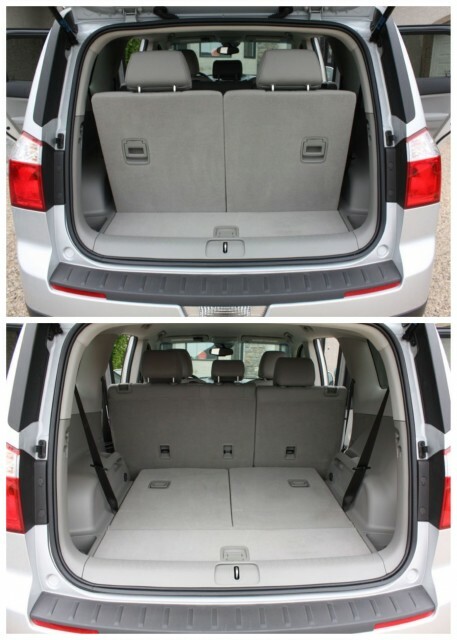 With the third row up, you’re left with virtually no cargo space – only 3.6 cubic feet (101 Litres) of vertical space. But fold down the third row, and you’ve got 26.1 cubic feet (739 Litres) and if that isn’t enough (it’s a LOT! ), you can fold both rows down, and you can house an entire village in the resulting 56.3 cubic feet (1594 Litres). Not only that, you can make this space work for you with the flexibility of a 60/40 folding second row, and a 50/50 folding third row. We comfortably moved our three kids in their seats and Saturday’s worth of home-improvement, gardening and grocery shopping stops. I was very impressed. The cargo space has a third 12V plug as well. I was surprised by how easy (and even fun) the Orlando was to drive. It’s not a quick vehicle, of course, but has plenty of get-up-and-go for everyday driving, and will get up to highway speeds without complaining. It’s quiet at low and high speeds, in terms of road, engine and wind noise. The transmission is mostly smooth, but I felt some jerkiness or surging between 2nd and 3rd gears on occasion. The transmission definitely wants to save fuel, and heads for the high gears sooner than later, and I didn’t think it was always in the right gear. It has a manual mode, which works at a glacial rate – you’re better off to leave it to its own devices. Although city driving acceleration is fine, I felt it took a bit long to downshift for passing at highway speeds – it’s not bad, you just need to budget for it. Where I was pleasantly surprised is how well the Orlando rides (it soaks up bumps very well, even though it’s firm) and handles (it’s confident around corners, and even though there’s body roll, it invites you to play a bit!) I wasn’t expecting a 7-passenger crossover to handle curves this well. The 49/51 weight distribution helps, I’m sure. Its surprising agility, paired with very low effort electronic steering, makes for an incredible turning radius and sets this apart as a parking lot warrior. Unfortunately that same steering has a numb feel on the road. I did feel that there was a bit of drumming over road irregularities and that intruded into the cabin with some road noise, but over good roads, it was very quiet. Outward visibility is good for the front and sides, but terrible out the back – the headrests from both rows invade your view – and shoulder checking is difficult because of the thick rear pillars. I loved the dead pedal. Thank you Chevy! The side-view mirrors are big and effective. There is a flip-down ceiling-mounted mirror that lets the driver see everyone in the vehicle – lifted from the mini-van class, it’s a great addition. 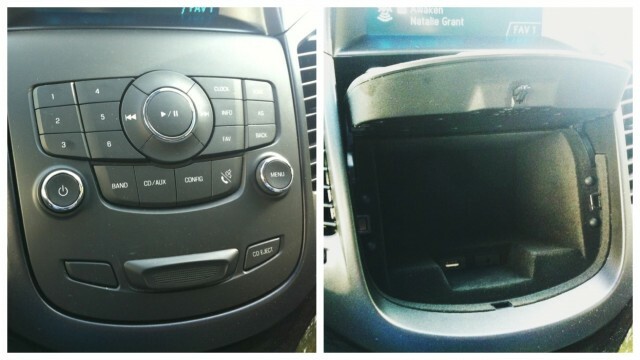 A neat touch was that the entire stereo panel can be unlatched with a button, and it flips up and out of the way, revealing a deep, carpeted storage area and the USB/aux plugs. Love it! So, is this a mini-van killer? Of course not. I think the Orlando is proving a tough sell, because it’s in no-man’s land and confuses potential buyers. It’s tough to pinpoint its direct competition. It provides more utility than most small cross-overs do, with the flexibility of a third row and cavernous cargo space, yet the lack of sliding doors, and no space behind the third row might throw consumers off – though it shouldn’t – that’s no different from other cross-overs. It’s too bad, because this vehicle deserves a shot. It’s a good vehicle, priced reasonably, and feels well put-together and refined for this class. It’s built on a stretched Cruze platform, which is a winner. It takes up significantly less real estate than competitors that offer similar utility. It gets great mileage, all things considered – heck, it even likes curves and offers a bit of fun on the road and is a bang-up road trip vehicle. No, it’s not what some consider a cool ride, but for wagon/van nerds like me, who appreciate driving something smaller than a behemoth and getting decent fuel economy, it might be the exact answer to our question. I give the Orlando a solid 7 out of 10, and wouldn’t hesitate to consider it for my own garage. WAF (Wife Acceptance Factor) was quite high. She’s a mini-van girl, and she liked the way it drives, the room it provides and how “smooth” it is. She wasn’t super keen on the styling, but the fact that it had lit vanity mirrors on both sides made up for it.